News tend to be well hidden and there are people who would do anything to keep them in the dark. More outstanding photo journalism, birthdays and a day for intercultural dialogue are on the menu for today’s update on the event section. I was told I should absolutely include this exhibition into the event section. It is a collection of the most impressive, shocking and breathtaking press photos of the last year. There must be less and less important things happening in the world. Or is it that we are less interested, maybe? Watch the following TED talk about international news coverage in the US. The number of foreign correspondents has not only been reduced in the US. Similar cuts have been made in Great Britain. 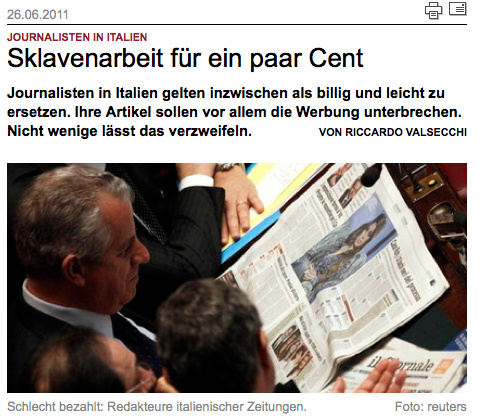 The German newspaper TAZ writes on how Italian journalism “is only there to fill the gaps between advertisements“. How bad is the situation of journalism nowadays? The fact that nowadays journalists cannot survive on their wages – a problem present not only in Italy – is not the only issue newspapers encounter.